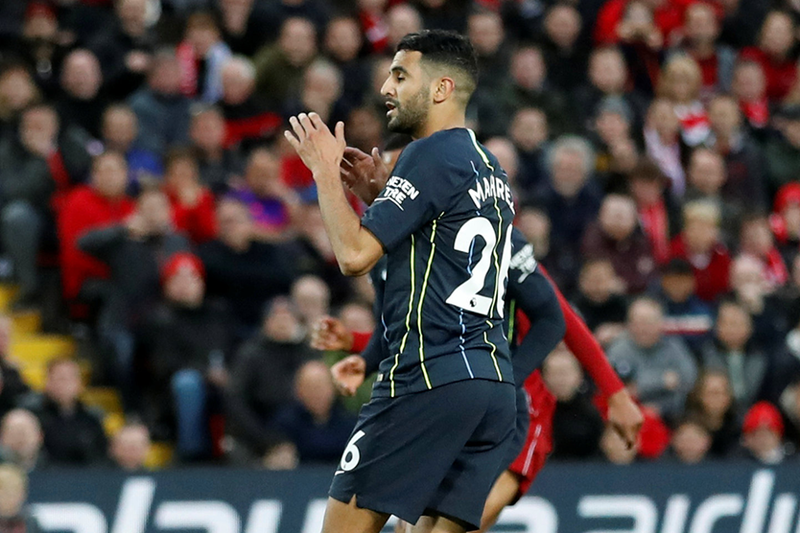 Manchester City are still searching for their first win at Liverpool in 15 years as they were held to a 0-0 draw after Riyad Mahrez missed a late penalty. Man City had a great chance to claim their fifth straight league win when substitute Leroy Sane was brought down by Virgil van Dijk inside the area on 84 minutes, only for Mahrez to fire his spot-kick over the bar. Mahrez had gone close twice before, first putting a shot just wide and then having an attempt saved at the near post by Alisson Becker. Mohamed Salah had Liverpool's best chance but could only curl his strike at Ederson. Both sides remain unbeaten and the result puts City back on top of the table with 20 points, ahead of Chelsea and then Liverpool on goal difference.